Choices for natural home fragrance may include a bouquet of fresh flowers or herbs, or a bowl of handmade dried flower potpourri refreshed with real essential oils. I thought I’d try experimenting with an alternative to the gel air freshener: natural room fragrance jars. Commercial gel air fresheners are often a chemical-laden jelly in a violent shade of blue, supplied in a flimsy plastic tub. I thought I’d try and make something more pleasant to use, and after some research developed this recipe for homemade room fragrance gel. Add one level teaspoon of agar powder to 350ml cold water, stir thoroughly and heat until fully dissolved (this happens nearly at boiling temperature with agar jelly). Remove from the heat and add the salt, stirring until dissolved. Allow to cool until tepid. In a separate bowl add the essential oils to 75ml cold water. Add the liquid containing the essential oils to the agar and stir in quickly. Before the mixture starts to set, pour it into three ramekin dishes or small jam jars and leave to finish cooling. Decorate if liked, and position out of reach of children and pets. I chose to use agar agar, which is a natural jelly made from seaweed. If you prefer to use gelatin sheets, follow the instructions on the packet after dissolving the salt – you won’t need to heat the water to such a high temperature. The salt is an antibacterial agent which should stop the mixture deteriorating once made. Use a single essential oil or a combination in your room fragrance jar. Make sure the mixture is only tepid when you add the oil, as volatile components may evaporate straight away, shortening the life of the air freshener. To further protect against children and pets, a jam jar with screw-top lid can be used: punch holes in the lid to allow the essential oils to circulate around the room. 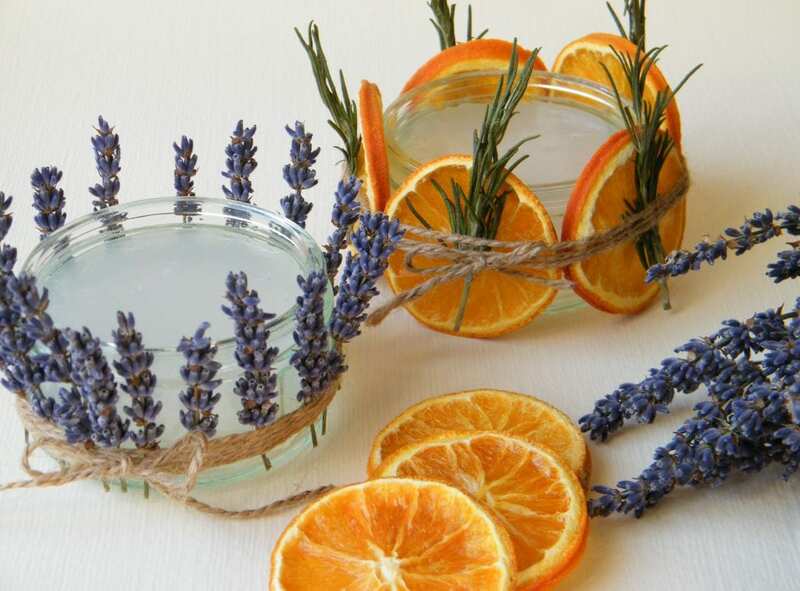 Decorate the outside of the jar with items reminiscent of the contents – I used dried lavender and rosemary; dried orange slices (citrus slices can be dried by placing in the oven on its lowest setting for a few hours), and garden twine. Colour the gel if you like with a drop of food colouring, or add shells or silk flowers to the mixture. If the fragrance starts to fade, move to a warmer spot such as a windowsill or radiator shelf, but discard if it starts to discolour. 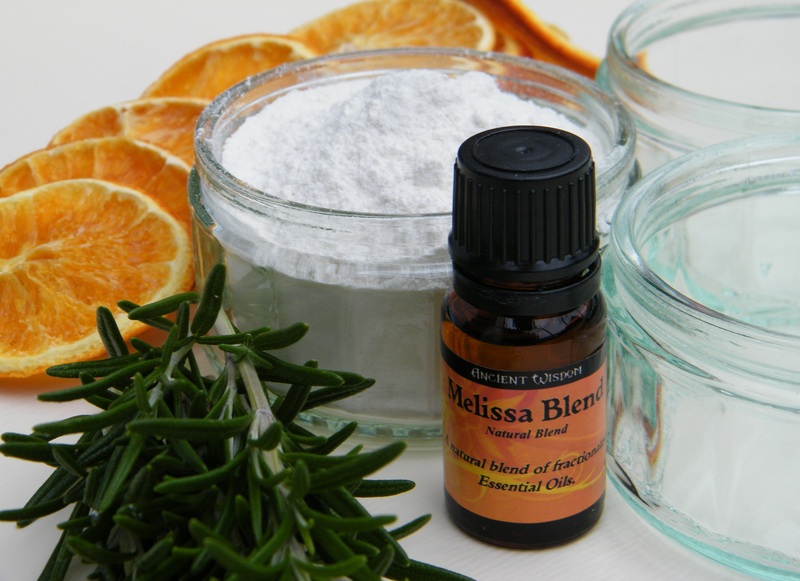 I used melissa blend essential oil for one batch of my natural room fresheners. Melissa officinalis has a light, fresh, lemony scent that I find uplifting. As it is a very volatile oil, it is very expensive to buy, so melissa blend is an approximation made by mixing similar less expensive oils such as lemongrass and citronella. This fragrance is lovely in a bathroom, and would set you off on the right foot in the morning! For a good night’s sleep I recommend half and half chamomile and lavender. For work and concentration you could try half and half rosemary* and orange: use this combination in the office. It is also suitable for use in the kitchen, as both oils have a culinary association. This article about natural room fresheners was first written for the Herb Society magazine, Herbs, March 2016 issue. 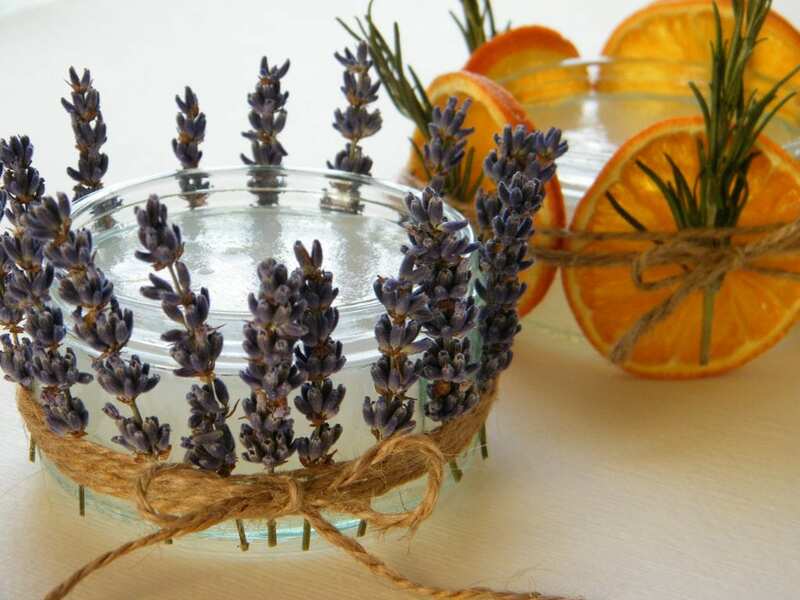 For more ways to fragrance a room, check out the dried flower potpourri category on this blog.